Where do I use my Great Outdoors Superstore voucher code? The Great Outdoors Superstore team are a collection of highly knowledgeable and experienced individuals in the outdoor industry - over 30 years of experience ensures you’re in the best capable hands whenever you enter a store. Whatever your next outdoors inspired initiative is, Great Outdoors Superstore has got you covered; whether it’s a new raincoat for walks at the weekend, a new set of boots for hiking or a complete new haul of gear for camping, there’s something for everybody! 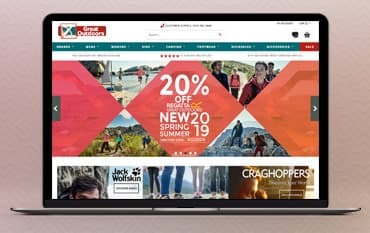 It’s no hassle when shopping online with the Great Outdoors Superstore website, their streamlined purchasing process has prioritised ease of use for their valued customers; simply browse by category (brand, gender, camping etc) and choose the relevant sub-category, you’ll then be directed to a page of products suited to your needs. Great Outdoors love giving their customers value for money, check out their generously discounted sale to be in for the chance of bagging a bargain! You can be reassured that you’re in safe hands when shopping with Great Outdoors Superstore - backed by an impressive 5-star rating from Trustpilot. Trying to source some outdoor gear but don’t fancy breaking the bank? Good news, your next big venture out could become much cheaper thanks to the Great Outdoor Superstore sale! Mind-blowing savings with certain items reduced by a minimum of 60%; all the same products, at staggeringly low prices - coats & jackets, fleeces, tops, etc. All the big brands you know and love at jaw-dropping prices: Regatta, Jack Wolfskin, The North Face, Trespass and more! Get in the know, sign up to the Great Outdoors Superstore newsletter service - simply register with your email address on their website and you’re good to go! Be first in line to hear all about exclusive product news, offers and promotions - in addition to having the chance to enter free competitions, win prizes such as clothing or accessories! Don’t forget whenever you order with Great Outdoors Superstore, it’s free standard delivery on orders £50 or more. What is the Great Outdoors Superstore contact number? 03300 415448 - When calling please choose option 2 for web sales or option 3 for the store. What delivery services does Great Outdoors Superstore offer? Great Outdoors offer a standard delivery service which uses Royal Mail 48 Hour. For higher priced items (over £100) they use a tracked service for further security and peace of mind at no extra cost. Valid for UK mainland orders only (excludes Northern Ireland, Scottish Islands, Isle of Man). Great Outdoors also offer the option of Premium Next Day Delivery through DPD which guarantees your parcel will be with you within 24 hours of dispatch and can be tracked (excludes Scottish Highlands and Islands). Great Outdoors Superstore is proud to be one of the largest outdoor clothing and equipment retailers in the north of England, with two stores in Newcastle and Shiremoor. Over 30 years of experience attained in the industry has developed the company into the reputable powerhouse it is today - bolstered by top drawer products, competitive prices and customer service rivalled by none. Venturing into the outdoors was once a relatively daunting task, with the help of Great Outdoors Superstore, procuring the necessary clothing and equipment has never been simpler, or cheaper. You’ll be glad to hear all of the big-name brands can be found at the Great Outdoors Superstore: Berghaus, Columbia, Jack Wolfskin and more - don’t miss out on the extensive range of products and huge discounts to be had! Always remember to shop with a discount code from NetVoucherCodes to get the most for your money with Great Outdoors Superstore.